4-CD Box (LP-Format) mit 60-seitigem Buch, 110 Einzeltitel. Spieldauer ca. 245 Minuten. Bill Monroe erzählen. Charlie Monroe stand nun auf eigenen Füssen und konnte sein ganzes Talent zeigen. 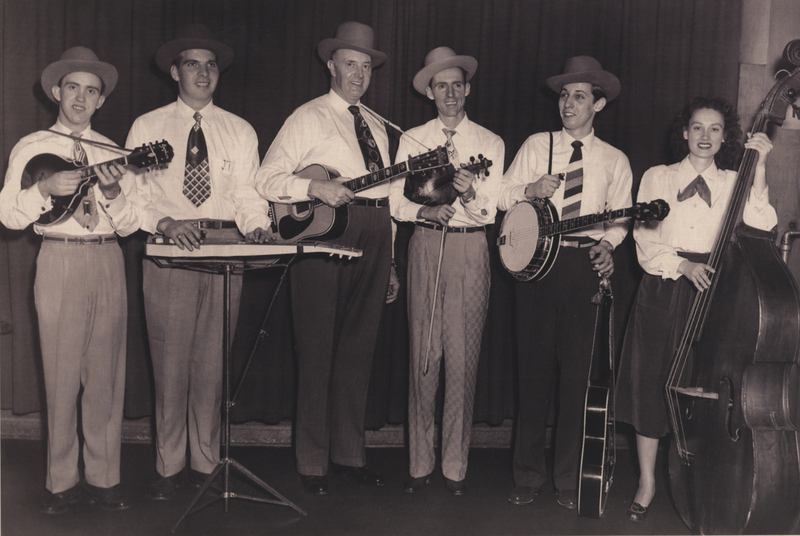 Er war ein freundlicher Mensch und seine Gruppe, die Kentucky Pardners, fühlte sich bei hohen Geschwindigkeiten ebenso wohl wie Bill Monroes Blue Grass Boys. Vielleicht eroberte Charlie Monroe weniger neues musikalisches Terrain als Bill. Auf alle Fälle besaß seine Musik einen lebendigen und persönlichen Sound. Und er konnte ein paar Hits landen, allen voran Bringing In The Georgia Mail. Charlie Monroes Stimme war hoch, lieblich und munter. Mit seinem grenzenlosen Optimismus traf er den Nerv der Zeit während des Zweiten Weltkriegs und er konnte seine Popularität durch die gesamten vierziger Jahre bewahren. Seit jenen Tagen war Charlie Monroes Musik nur schwer zu bekommen. Zu Unrecht geriet er in Vergessenheit, und man erinnerte ihn fast ausschließlich als Bills gelegentlichen Sparringpartner. Bis heute. Im Jahre 2002 packte Bear Family das gesamte Material der Monroe Brothers auf eine umfangreiche Bill Monroe-Zusammenstellung (BCD 16399). Diese Edition hier ist so etwas wie der Weggenosse jener viel gepriesenen Monroe-Ausgabe. Erstmals bekommen wir Gelegenheit, Charlie Monroes Aufnahmen von 1938 bis 1956 - einschließlich all seiner Einspielungen für RCA/Bluebird und Decca - zu genießen und neu zu bewerten. Charlie Monroe wusste, wie er eigenständige, mitreißende Musik produzieren konnte. Mit dieser historischen Veröffentlichung schließt Bear Family seine umfangreiche Monroe-Serie ab. Sämtliche Studioaufnahmen beider Monroe-Brüder liegen nun als hypermoderne Sets mit sorgfältigst restauriertem Klang, mit zuverlässigen Kommentaren und Originalfotos vor. Eine Bonus-CD liefert von Mike Seeger gemachte Liveaufnahmen der Jahre 1955/56 von der New River Ranch. 15 Is She Praying There? 28 Why Did You Say Good-Bye? 05 Why Did You Ever Say Goodbye? 28 Who's Calling You Sweetheart Tonight? Younger children often dread following older brothers and sisters through school, especially if the latter have been academically gifted or models of deportment. When an irritated teacher stands in front of a classroom and asks, "Why can't you be like....?," younger siblings understandably want to crawl under their desks and hide. Fortunately family paths tend to diverge, and childhood humiliations are reconciled or recalled mostly during psychiatric consultations. Charlie Monroe was in good company: other accomplished and overlooked relatives of celebrities include Milton Eisenhower, Bob Crosby, composers C. P. E. Bach, Clara Schumann, and poet Ted Hughes (husband of Sylvia Plath). Gummo and Zeppo were also Marx Brothers, and baseball pitcher Daffy Dean is remembered mostly because his brother Dizzy could pitch some too. And don't forget Lester Young's talented brother, drummer Lee Young, and Clarence Holiday, jazz guitarist and father of Billie. 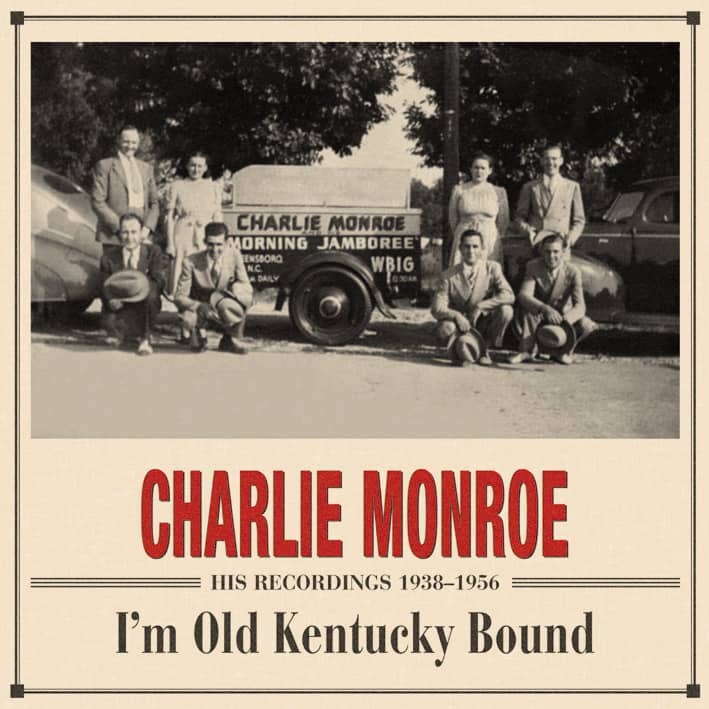 It wasn't Charlie's fault that he wasn't Bill Monroe who, in comparison, seemed to get more than his share of breaks in the evolving country music world of the 1940s. Both brothers were blessed with enormous talent; the records they made together between 1936 and 1938 demonstrate that each was an artistic match and perfect foil for the other, and together they raised the bar considerably for the brother duet genre that defined much of the country sound of the 1930s. Their mutual loss when they separated was immense, and it took several years before they were individually able to recapture the popular following and musical authority they'd commanded as the Monroe Brothers. Undeniably Bill became the more influential of the two, but Charlie's artistry was also considerable. Charlie (born 1903) and Bill (born 1911) were two of the eight children born to Malissa Vandiver (1870-1921) and John Buchanan 'Buck' Monroe (1857-1928) and raised on their farm near Rosine, Kentucky in the northwestern part of the state near the edge of Indiana. Buck was descended from Scottish settlers; his great grandfather John fought in the Revolution and was rewarded with land in Kentucky. The Vandivers made up the musical side of the Monroe family. Malissa's ancestors included a mixture of seventeenth century Dutch and nineteenth century Irish immigrants. She could play several instruments and her older brother Pendleton Vandiver (1869-1932) was the fiddling Uncle Pen of Bill Monroe's classic tribute, and the man for whom Charles Pendleton Monroe was partially named. Charlie was the fifth of eight children, born on July 4, 1903 (Louis Armstrong and George M. Cohan also cited July 4 birth dates, but neither was accurate). Charlie later claimed to enjoy the day because all the banks were closed. Bill was the last child born to Malissa and Buck, who were 41 and 54 respectively when he arrived in 1911, three years after his sister Bertha. Being so much younger than his brothers and sisters, Bill was a solitary child whose impaired vision was never corrected. Memories of his childhood in later years tended to be bleak and lonely. Charlie's siblings were closer in age, and he remembered being part of a big, happy brood. "Back in those days times were pretty hard. Us boys, we cut timber and we drug logs and we worked a sawmill. Our dad had a 655-acre farm and it had coal under the ground. So he operated the coal mine, timber chopped. Mama raised chickens and turkeys, took care of us kids, took all the chores off Dad that she could, and she always cooked the best to eat that she had in the house. "And we used to walk to school about a mile and a half, out to a little school called Horton, Kentucky. [Mama] could tell right to the minute when we was supposed to be home; we had chores to do and everybody had his job." Charlie remembered that all his siblings could play a little music, but his greatest respect was reserved for Malissa, who "would, doing her work around the house, sometimes she would pick up the old fiddle and she'd saw off an old-time number like 'Old Joe Clark' or some of the old stuff... and she played an accordion and she played a harmonica. "Dad said, 'Malissa,' said, 'put on your coat... ride over with Mr. Wright, play the fiddle for them to dance a little bit.' Mom got right on the horse, rode off, and the man followed right behind her on his horse. They rode over, she got right off and walked right in where the crowd was, took her fiddle out, and you never heard such fiddling in all your life—just sawed to death. "Stood up, wouldn't sit down, just stood up and put the music right in your feet. Made you want to dance. So we danced right on and it was getting time to break up and go home. The man asked, 'Now, Malissa, what do I owe you?' She said, 'All I want to do is to dance a couple of sets.' So she got down on the floor [with] her partner, and she just knocked that old flat-footed back step just as natural as walking down the road." "Uncle Pen was a great fiddler, and I just used to love for him to get that old fiddle and sit down and start playing. And I'd just love to follow him because he had the best timing of any man to follow. I was just learning the guitar a little then, just what I could pick up here and yonder. We played 'Cumberland Gap,' and that old tune goes in one minor. I stuck that minor in on him and he just shuffled that bow full length and had the nicest grin on that old face. It tickled him to have that old run thrown in on him there, you know—yeah, he liked that! "Uncle Pen was quite a trader; he traded horses, mules and cows. Uncle Pen could trade with you and he could skin you out of your eye teeth, and he'd laugh about it. Back in those days he would always bring us a little hard stick candy--we thought he was the finest man that ever lived." Charlie was eleven when he got his first guitar. "An old guitar, had one string on it, and it didn't have a case. I said, 'Mama, I bought a guitar.' I bought it on credit. She said, 'What did you pay for it?' I said 'three dollars—not but one string on it', I said, 'Mama, I've got to have five more strings.' She said, 'Well, if you're going to have five more strings, we're going to have to pick up a few more chickens, frying chickens, and take them to town. So we walked and carried them and she bought me five strings. And I brought them home and strung that old guitar up and I don't guess I slept over two hours the whole night long, beating around on that old guitar. Out of tune, couldn't sing, couldn't chord, nothing!" Kundenbewertungen für "I'm Old Kentucky Bound 1938-56 (4-CD)"
One of the best box sets yet. 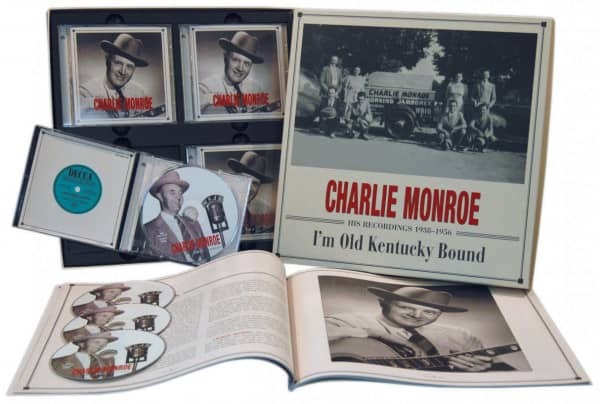 Finally, someone has given Charlie Monroe the respect he deserves. Many thanks for an excellent production.